Runecrafting is one of the few skills that has the ability to create huge amounts of money for the people who are patient enough to train it up. Even at lower levels, Runecrafting can make around 200,000 gp in a single hour! It may sound like a very simple skill to train, just running to and from banks, but there are many techniques that can be used to train efficiently. This guide is here to help you find the quickest ways to train up this wonderful skill, and hopefully make you enough money to buy every item you ever wanted. 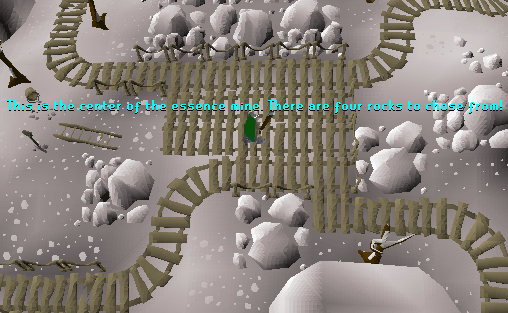 The Rune Mysteries quest is no longer required to begin runecrafting. 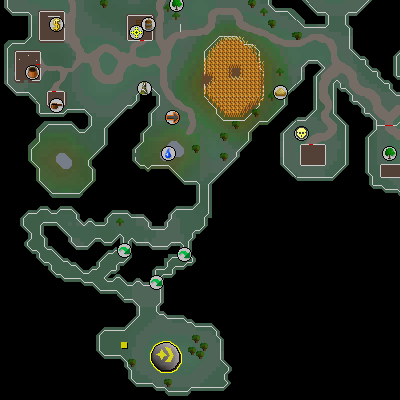 The quickest way to train Runecrafting now is The Runespan. The Runespan can be used at any level but you cannot take any runes out of the runespan, which means you cannot keep any of the runes to yourself. 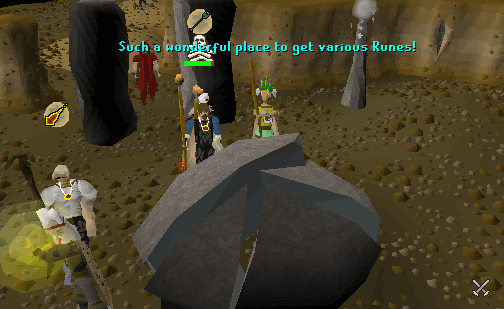 For more traditional methods of runecrafting, see below. As with everything in Runescape, having completed other things and have the ability to do certain actions will make it faster. Runecrafting is no exception to this, and there are many things that will help you gain faster experience. All the skills in the game interact with each other in some way. The following levels are suggested before attempting to Runecraft, but are not vital, and Runes can be crafted without them. The higher your Agility level is, the faster you will be able to obtain experience. 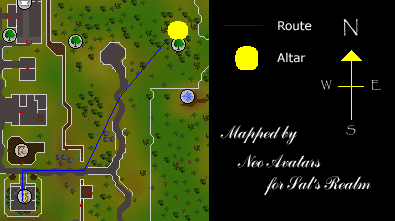 This is because while Runecrafting, you will need to do a lot of walking and running between banks and altars. With higher Agility levels, your Run energy will re-generate quicker, meaning that you can run for longer, and obtain experience faster. 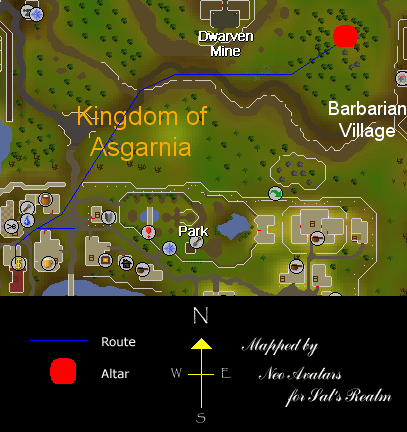 Around Runescape there are shortcuts which require certain Agility levels to go through. Many of these don't help when Runecrafting, but there are some which will increase the experience you can gain by a very large amount. There are several rooms that can be built within your house that can help train Runecrafting if they have the correct items built within them. At level 45 you have the ability to build a Chapel and an altar within it. When Runecrafting through the Abyss, your Prayer will be drained to 0, meaning you are more open to attack from PKers who want the items you are carrying. 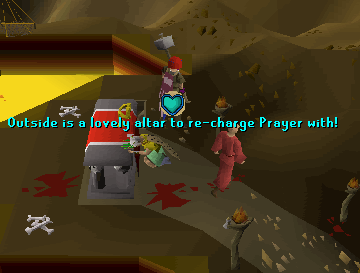 By Praying at the altar you will be able to re-charge your Prayer, then go past the Pker with Protect Prayers on, making it less likely that the attacks will hit you. At level 35 you have the ability to build a Quest Hall, but the advantages with this room don't come until level 47. At this level you have the ability to mount an Amulet of Glory on the wall which can be used to teleport to Al Kharid, Draynor Village, Edgeville or Karamja. The advantage with this is that it has unlimited charges and doesn't need to be charged in the fountain in the Heroes Guild. 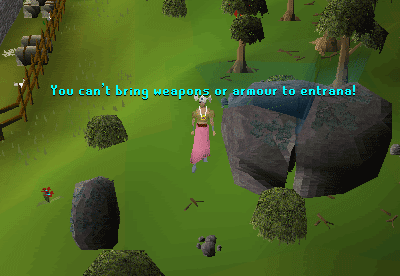 It also means that if you decide to go through the Wilderness and need to go back to Edgeville, you don't risk losing the Amulet if you get killed. At level 50 you have the ability to make a Portal Chamber. Within this room you can build portals which give you unlimited teleports to the location that you have charged them to take you. 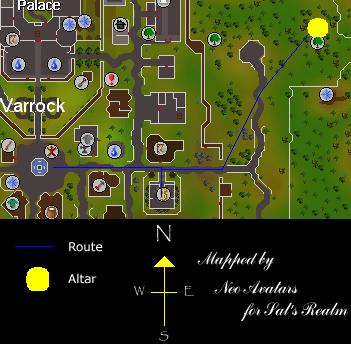 This helps because when you are crafting Earth Runes and wish to teleport to Varrock, you don't have to waste a space in your inventory with a Fire Rune, but can craft the Earth Rune, teleport to your house, then use the Varrock Portal to get to Varrock. At level 23 Crafting you have the ability to make one of the key items used when Runecrafting, the Tiara. Tiaras are used to save the space in your inventory that the Talisman would normally take up. If you don't have 23 Crafting to make your own, go to a busy bank and you will probably be able to buy one. At level 27 Crafting you will have the ability to make Emerald Rings. These can be enchanted using the Enchant Lvl-2 Jewelry Spell, requiring level 27 Magic, to create Rings of Dueling. These rings are often used when trying to craft Fire Runes since the Fire altar is near the Duel Arena teleport on the ring. These can also be bought in bulk from other players on the official forums. At level 29 Crafting you have the ability to make Emerald Necklaces. These can be enchanted using the Enchant Lvl-2 Jewelry Spell, requiring level 27 Magic, to create a Necklace of Binding, which gives you a 100% success rate when trying to use a certain kind of Runecrafting and making combination runes. These are very rarely traded since the demand for Combination Runes is low. They are also fairly bad experience. At level 80 you have the ability to make Dragonstone Amulets. These can be enchanted using the Enchant Lvl-5 Jewelry, requiring level 68 Magic, to create an Amulet of Glory. These amulets are used to teleport to places like Edgeville and Draynor Village which are popular Runecrafting destinations. These amulets are also traded very often. The higher your Defence level, the better if you are a member. When crafting through the Abyss, there are monsters that will attack you as well as the players outside who want to kill you. By having a higher Defence level, less of these attacks will hit you, meaning you use less food, and make more profit. Although Farming doesn't really help you when training Runecrafting, if you plant your seeds, then craft some runes, you will often be able to cover the costs of the seeds by selling the runes you make! When using certain methods to craft Runes, you will be attacked by monsters, players or both. If these hit damage then you will want to heal so that you don't die. By having a high fishing level, you will be able to catch your own fish to heal you, rather than buying them and lowering your profit. At level 26 Herblore you can make Energy Potions. These potions heal 10% of your energy per dose you drink. At level 52 you can make Super Energy Potions which heal 20% of your energy per dose. By using these to increase your energy, you will be able to run for longer and get faster experience. The reason you want a high Magic level for Runecrafting is because of the many teleportation spells available. Ranging from level 25 for the Varrock Teleport, there are numerous teleportation spells that can help speed up the time it takes to craft each load of Essence. The higher your Magic level, the more teleportation spells you can cast, and the faster you can gain experience. Without Mining, Runecrafting would be impossible. 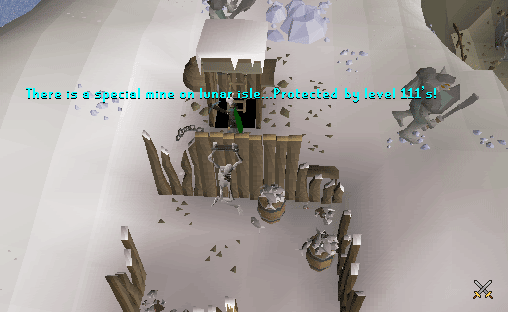 At level 1 Mining you have the ability to mine Rune Essence. This gives 5 Mining experience per essence, and the essence can be used to create any rune that Freeplayers have the ability to craft. If you are level 30 Mining and on a Members world, when you try to mine Rune Essence you will get something different. This item is called Pure Essence. It is very much like Rune Essence, but can be used to craft any Rune, not just freeplay ones. At level 20 you have the ability to mine Silver Ore. This can be smelted into a bar, then crafted into a Tiara to be used while Runecrafting. At higher Ranging levels, you can wear better Dragonhide Armour. 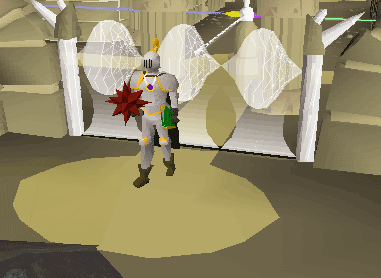 This armour has a high Magic Defence, meaning that if a PKer tries to cast a spell on you, there will be a lower chance of the spell hitting. It is also light weight so if you need armour with a slight Melee Defence, it doesn't drain Energy faster than you can count it dropping, but you get the small amount of Defence that you need. At level 20 Smithing you have the ability to smelt Silver Ore so that it turns into a Silver Bar. This bar can be Crafted to make a Tiara. Questing is something that can be done by all. You need to complete the Rune Mysteries Quest to be able to Runecraft, but there are many more that will help you achieve higher Runecrafting levels. Desert Treasure - After completing this quest you have the ability to use the Ancient Magic spells. The teleportation spell to Paddewa is often used when Abyss Runecrafting since it means that you can't lose your glory amulet if you die, because you don't take one with you. 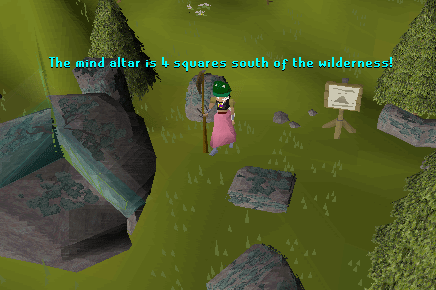 Devious Minds - This quest requires 50 Runecrafting to start it, but has a reward of 5000 Runecrafting experience! Dragon Slayer - After completing this quest you have the ability to wear Dragonhide Bodies as long as you have 40 Defence and the required Ranged level to wear the type of Dragonhide. Elemental Workshop I - During this quest you will make an Elemental Shield, which gives a +6 Magic Defence bonus, meaning the Abyss Pkers who use Magic spells will have more chance of their spells missing. Elemental Workshop II - As a reward of this quest, you will receive a Mind Helm (+6 to Magic Defence), and the ability to smith Mind Shields (+9 Magic Defence). Eyes of Glouphrie - This quest has a reward of 6000 Runecrafting experience! Fairy Tale Part 2:Cure a Queen - When you complete this quest you are given a lamp which will give 2500 experience to a skill of your choice as long as it is above level 30. This skill could be Runecrafting. After completing this quest you also have the ability to use the Fairy Rings. Grand Tree - Once you have completed this quest, you have the ability to use the Gnome Gliders. These Gliders can be used effectively when crafting Nature Runes as long as you have several Glory Amulets. Heroes Quest - After completing this quest you have the ability to re-charge Glory Amulets. Charged Glory Amulets are very helpful when Runecrafting since there are several altars where the nearest bank is either Edgeville, Draynor Village or Al Kharid. Legends Quest - When you complete this quest you have the ability to use lamps with a total value of 30,600 experience on any skill of your choice. This skill could be Runecrafting. Lost City - After completing this quest, you can access the Lost City of Zanaris and craft Cosmic Runes. 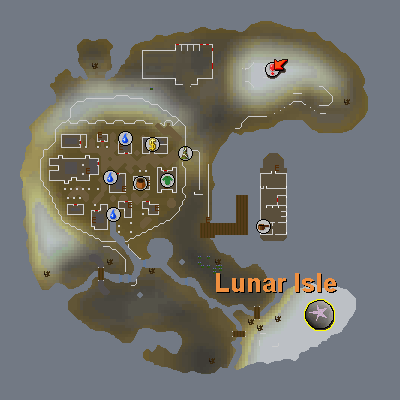 Lunar Diplomacy - After completing this quest you can access Lunar Isle, and craft Astral Runes. You also get 5000 Runecrafting experience as a reward! Mourning's End Part 2 - After completing this quest you have the ability to craft Death Runes. 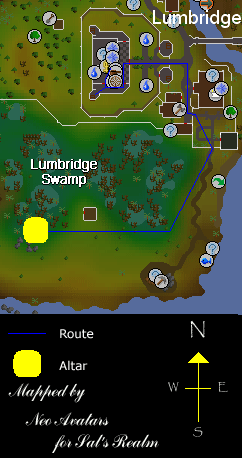 One Small Favour - When you complete this quest you are given two lamps which will give 10,000 experience to a skill of your choice as long as it is level 30 or above. This skill could be Runecrafting. Recipe for Disaster - When you complete this quest you are given a lamp which will give 20,000 experience to a skill of your choice as long as it is above level 50. This skill could be Runecrafting. Rune Mysteries - You can't Runecraft without completing this quest. A Tail of Two Cats - When you complete this quest you are given two lamps which will give 2500 experience to a skill of your choice as long as it is level 30 or above. This skill could be Runecrafting. Tears of Guthix - After completing this quest you can access the Activity of the same name which will train up your lowest stat. If Runecrafting is your lowest stat, this will give you experience for it without having to craft any runes! Temple of Ikov - During this quest you will obtain some Boots of Lightness. These reduce your weight by 4kg, making your Run energy last for longer. Troll Stronghold - After completing this quest you have the ability to craft Law Runes. Zamorak Mage Mini-Quest - When you complete this you will be given 1000 Runecrafting experience. 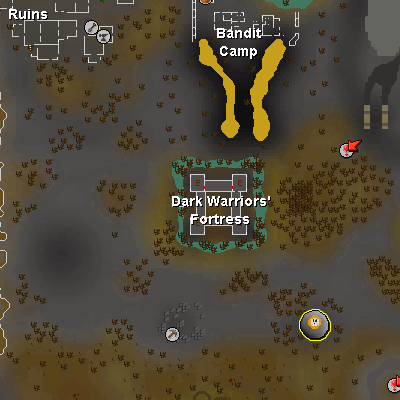 You will also have access to the Abyss, which is one of the best ways to gain fast Runecrafting experience, even though there is the risk of being PKed. Talismans and Essence are vital when Runecrafting, while Tiaras just increase the speed you get experience. 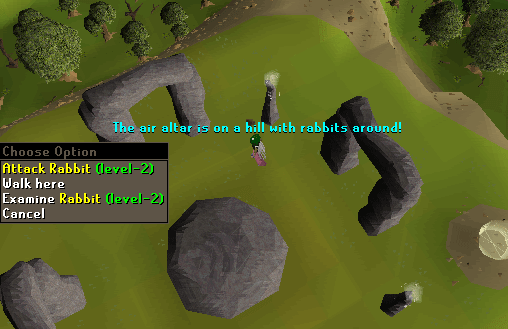 To enter the Runecrafting altars in which you will craft Runes, you must have a talisman of the same kind as the altar you are trying to enter. They can be gained as loot from certain monsters, from other players, or sometimes NPCs. Each talisman can be gained in a different way, and often there is more than one place that they can be found. If you need any of the Elemental Talismans (Air, Water, Earth and Fire) then the best place to get them is by killing the Elemental Wizards. 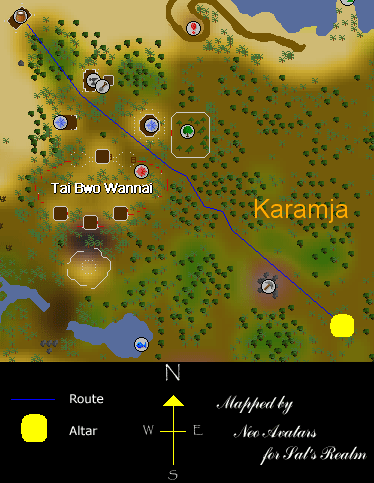 They can be found south of Falador, just past the Clan Camp, and just northwest of Port Sarim. Each Wizard will either drop Runes or the Talisman of the element that they are. Other Wizards like Dark Wizards will also drop Talismans fairly often. Dark Wizards can be found in the Dark Wizards' Tower, just north of the Makeover Mage, in Draynor Village, and the Stone Circle near Varrock's south entrance. If you don't like getting attacked by Magic attacks and want to craft Body Runes, Guards will often drop Body Talismans. If you're on a Member's server then you may even be lucky enough to get Cosmic or Nature Talismans off Guards too! Chaos Talismans aren't used very often because it is such a long distance to go to craft them, but if you do want to craft Chaos Runes without the Abyss, monsters like Lesser Demons and Hill Giants can drop the talisman. Almost all of the Talismans, Nature and below can also be obtained from Random Events like the Mysterious Old Man. They can also be found as drops from monsters inside the Abyss. The most difficult Talisman to obtain is the Death Talisman. This is because of the large number of quests required to gain it and that there are only two ways to get it. The easier way is done during the Mourning's Ends Part 2 quest. This involves collecting a list of 50 items for Thorgel the Dwarf that are found a long way apart. Since it takes 2 or 3 hours to collect all of these items, it is suggested that you do not lose the talisman because you will have to collect all the items again to get a new one. The only other method of getting this Talisman is by killing level 182 Dark Beasts within the Temple of Light Dungeon. These require level 90 Slayer to kill, so the time it takes before even having the ability to kill these monsters is huge, and even then there is only a small chance of getting a Talisman as a drop. Since it is so hard to gain this Talisman, the route from the bank is so long and the Talisman is untradeable, it is suggested that you keep the Talisman you get during Mourning's End Part 2 incase you do need it again for some reason. There is one more Talisman which can only be found in a single location. This location is the Abyss and the Talisman is the Elemental Talisman. It is a monster drop that can be obtained from any of the monsters within the Abyss. It gives access to all of the Elemental Rune Altars, so can save precious bank space, but cannot be made into a Tiara so the experience gained by using it is slightly lower. Now that you have your Talisman, you will want to be able to get the best experience using it possible. To do this you will require a Tiara so that you save one space in your inventory for every trip from the bank to the altar you make. A single space may not sound like much, but if you decide to make 1000 trips, that's 37 trips that you've saved yourself doing. There is a small investment of time obtaining all the Tiaras you want, but afterwards the rewards are huge. You could try buying one off another player or from a General Store, but making them yourself makes you feel like you have achieved something yourself, and experience from other skills will also come. To do this you will need 20 Mining, 20 Smithing, 23 Crafting and 100gp. Since Tiaras are made of Silver, you will need to choose a place to mine the Ore. This requires level 20 Mining and will give you 40 Mining experience for each Ore that you get. There are several places with more than one Silver Ore, both on Freeplay and Members, but one place is much better suited for what you need. 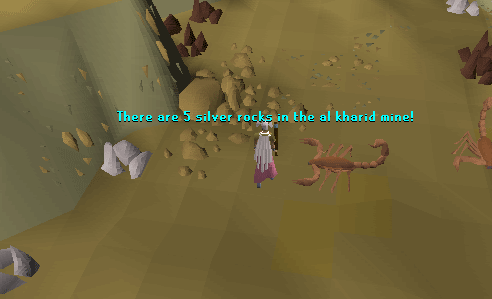 This place is the Al Kharid Mine. Along the length of the line there are five rocks with Silver Ore in. They are spaced out so there is a small amount of walking between the rocks, but this means that even if somebody else mines some of the rocks before you, you can run on to the next one and get the Ore before they do. Once you have collected the amount of Ore you need, one per talisman, you can move onto the next stage. Since you cannot make the Tiara out of the ordinary Ore, you must smelt it first. This requires level 20 Smithing and will give you 13.7 Smithing experience for each Ore smelted. 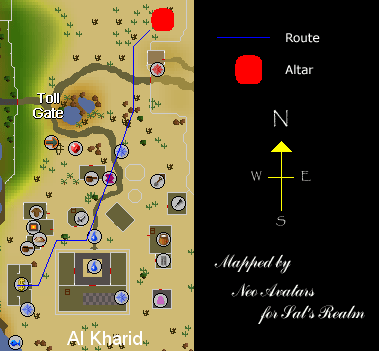 If you mined the Ore in the Al Kharid Mine, then there is a Furnace fairly near in the town of Al Kharid. When you choose to smelt Ore on the furnace you will be given a choice about what kind of Bar you wish to make. Right-click on the "Silver" option and choose to smelt as many Ore as you want Tiaras. Now that you have all the Bars you need, you can make the Tiaras. To make the Tiaras you will need a Tiara Mould. These can be bought from the Al Kharid Crafting Shop for 100gp, and can be used to make as many Tiaras as you want. Once you have your Tiara Mould, go back to the Furnace with both the Mould and all the Silver Bars you need in your inventory. Use a Silver Bar on the Furnace you a screen will come up in your screen. Right-Click on the Tiara symbol and choose to make as many Tiaras as you need. It's now time to enchant the Tiara! Now that you have done all the hard work and got both the Talisman that you want and a plain Tiara, it's time to combine them into one. Make your way to the altar that you have the Talisman for, go inside and use the Tiara with the altar. The Talisman and Tiara will combine into an enchanted Tiara which when worn will let you walk straight into the altar it is enchanted to without having to use any items on it. As well as being able to save a space in your inventory on each trip to and from the bank you make, you will be given a small amount of Runecrafting experience, the better the Tiara, the more the experience. Now that you have the Tiara that you want to use to enter the altars, you need to get some Essence to turn into Runes. There are two different kinds of Essence within Runescape. Some of this can be used to make all the different kinds of Runes, while the rest can only be used to make Freeplay Runes. Both kinds can be obtained in the same way, it's just Mining level and which world you are on that decides which you get. The first kind of Essence is just ordinary Rune Essence. This is the kind that you will obtain whenever you are on a Freeplay world or on a Member's world with less than level 30 Mining. For each Essence you mine, you will gain 5 Mining experience. This kind of Essence can only be used to craft Freeplay Runes. The second kind of Essence is Pure Essence. 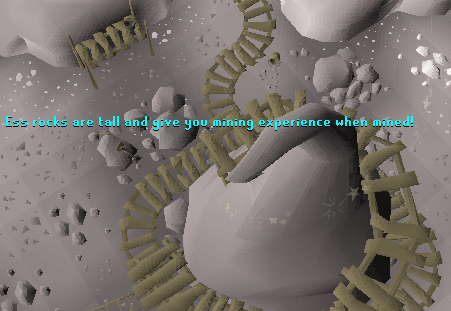 This can only be obtained when you are on a Member's world with level 30 or more Mining. For each Pure Essence you mine, you will gain 5 Mining experience. This kind of Essence can be used to craft any kind of Rune. 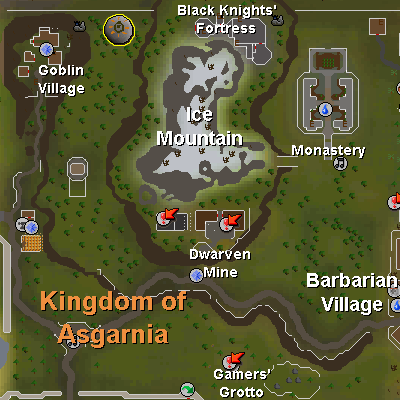 There are six places that you can mine Rune Essence, two that Freeplayers can access. 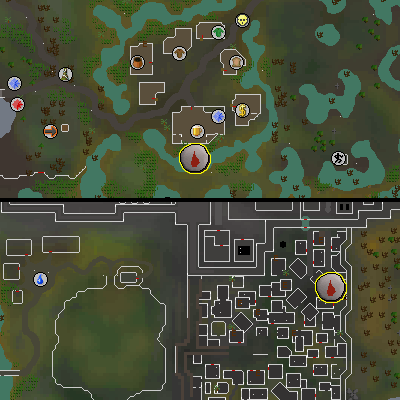 Five of these locations teleport you to an underground mine in a hidden location, while the other has an obvious location. Aubury - Aubury is the owner of the Varrock Magic Shop. 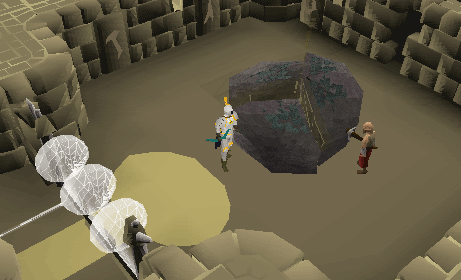 To get to the Rune Essence mine from him you must right-click him and choose to Teleport. Sedridor - Sedridor can be found in the basement of the Wizards' Tower. 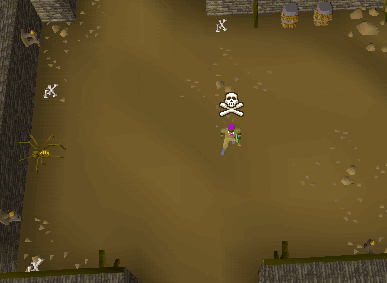 To get to the Rune Essence mine from him you must right-click him and choose to Teleport. Wizard Cromperty - Wizard Cromperty can be found in the building in the north-east corner of East Ardougne, to the east of the building in which you hire servants to help you with the Construction skill. 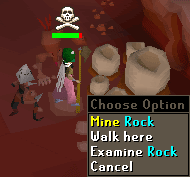 To get to the Rune Essence mine from him you must right-click him and choose to Teleport. 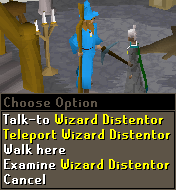 Wizard Distentor - Wizard Distentor can be found inside the Magic Guild in Yanille near the door when you enter. You need level 66 Magic to use this route because of the requirements to enter the Guild. 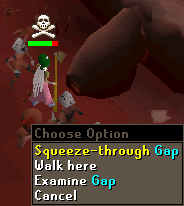 To get to the Rune Essence mine from him you must right-click him and choose to Teleport. Brimstail - Brimstail can be found in his dungeon in the Gnome Stronghold near the entrance. 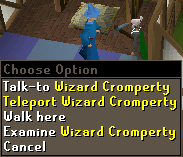 To get to the Rune Essence mine from him you must right-click him and choose to Teleport. 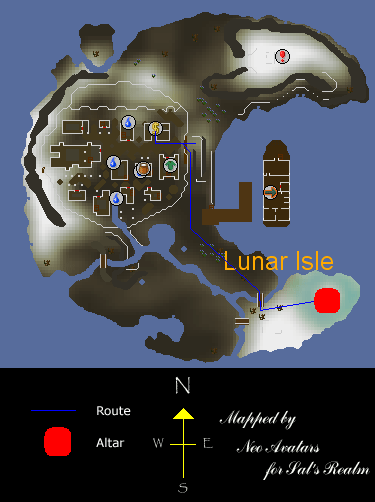 Lunar Isle - There is a mine to the north of Lunar Isle which is different to all the other Rune Essence Mines. The difference with this one is that it isn't a teleport to get to the mine, but a ladder that you must climb down. There is also only one Rune Essence Rock here, unlike the four that can be found in the other mine. Around the entrance to this mine are lots of level 111 monsters that are happy to attack you at any time. You must have completed the Lunar Diplomacy Quest up to the point that you get to the island to be able to reach the mine. There are two different Rune Essence Mines. 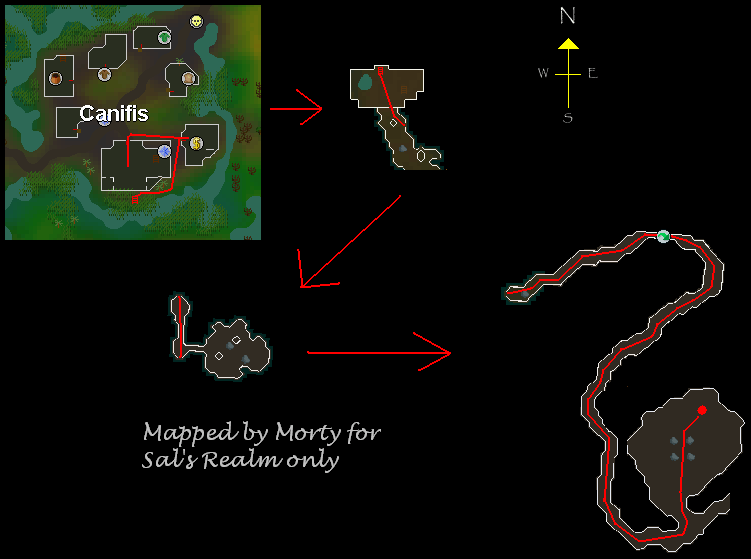 The one under Lunar Isle, and one that you are teleported to from each of the other locations. 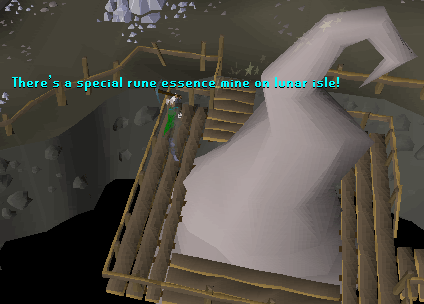 The Lunar Isle Mine isn't only a Rune Essence Mine, but there are Silver, Gold and Gem rocks within it too. The ladder that you enter the dungeon down is to the north of the dungeon, and the Essence Rock can be accessed across some wooden bridges in the center of the mine. The other mine is much more often used because if its many entrances. 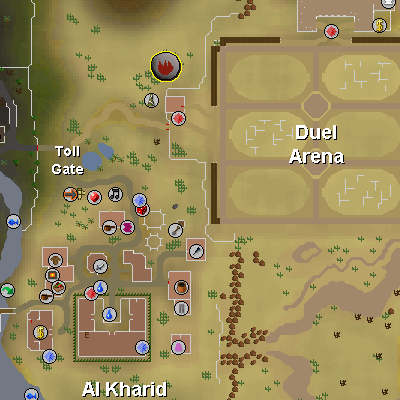 Every entrance that you teleport from will take you to the same mine, so somebody who teleported from Yanille, and somebody who teleported from Varrock would be able to see each other. The location within the mine that you will appear is random, but since there are four corridors from the center of the mine, with an Essence rock at the end of each one, it doesn't really matter. Once you get to the rock, you only need to choose to mine once, then your whole inventory can fill up with Essence. More than one person can mine a rock at a time, so there is no need to fight over who gets the respawn. When you have a full inventory or wish to leave, you must find one of the portals near the Essence rocks and choose to enter it. You will then appear at the location that you entered the mine from. 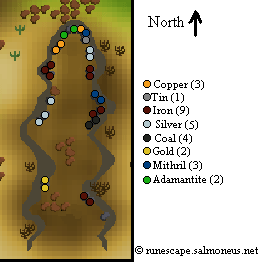 There are six different places that you can mine Essence, so which one is best? For Freeplayers this is an easy question since there are only two choices. 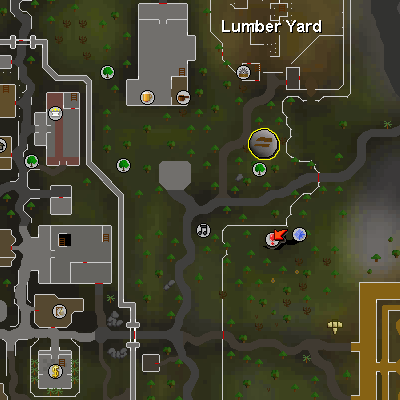 The entrance from the Wizards' Tower is a long way from a bank, so if you want to mine Essence on a Freeplay world, it should be done from Aubury in Varrock. For Members the best route is via Wizard Distentor in the Magic Guild, but that requires 66 Magic to enter so not everybody can get in. If you don't have 66 Magic then you have two options. 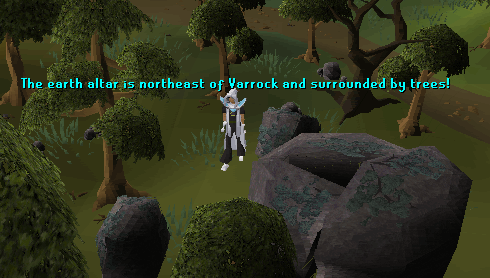 The first is from Varrock and teleporting from Aubury. The second is teleporting from Brimstail in the Gnome Stronghold. Both are about the same distance, so it's all about whether you like having people at the bank or not. Route Number: There will be a number here that will make it easier to tell which route is which. Members? Here it will say whether the route is members only or not. Map: Click on the link that will be found here to see a map of the route. Route Summary: A summary of the route will go here. When you get to the end of the route, start it again. Route Time: Here will be the time the route takes when walking the whole way. If you're running it will take approximately half the time. Inventory: Here will be a list of what should be in your inventory. Equipment: Here will be a list of things that must be equipped. If you can't get hold of items for reasons like they are Members only, ignore them. Experience per run: Here will be the amount of Runecrafting experience that you will gain on each run using the inventory that is specified. Runs per hour: Here will be the number of runs per hour you can make using the route if you are walking the whole way and don't get distracted by anything. Experience per hour: Here will be the number of experience you will gain per hour if you use the specified inventory, and walk the whole way without getting distracted. Other Requirements: If there is anything else that you should have to follow a route like levels or completed quests, it will be said here. When Runecrafting, it is suggested that you wear Boots of Lightness from the Temple of Ikov quest at all times if you are a Member because they reduce your weight by 4kg, meaning you can run for longer. Wearing a teleportation ring or amulet like the Ring of Duelling at all times is suggested so that if you get a random event that leaves you in the middle of nowhere or you get lost, you can teleport to a known location easily. Rings and Amulets are good because they don't weigh anything, meaning it doesn't increase the rate that your Run Energy will lower. These items won't be put in the equipment lists because they aren't vital to complete the route, and apply to every single route. If a route requires Teleportation Runes, it will state the number of Runes required for a single teleport. To make the time you spend at the bank lower, bring Runes for more than one teleport. In all routes it says that you should take a Tiara rather than a Talisman. If for some reason you can't get a Tiara, you can swap one of the Essences for the Talisman. Air Runes are the only rune that you can make at level 1 Runecrafting, and can give good experience for Freeplayers all the way to level 99 if you use the right method. 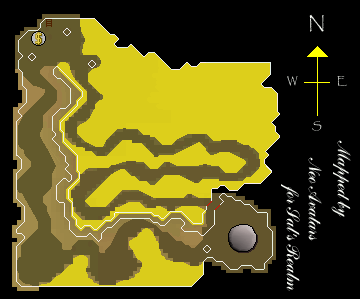 The altar can be found east of Barbarian Village and west of Gertrude's house in Varrock. Once inside you will be on a hill with steep drops around and level 2 Rabbits within view. For each Essence that you turn into Air Runes, you will gain 5 Runecrafting experience. Members? This route is available for all to use. Level 25 Magic is required for Varrock Teleport. Members? This route is members only. Other Requirements: Must have completed the Hard Tasks of the Varrock Tasks List. At level 2 Runecrafting you will get the option to craft another kind of rune, Mind Runes. Many will change at this point thinking that just because you get 5.5 experience per Essence, instead of only 5 when making Air Runes, the experience is faster. There are actually very few routes for making Mind Runes that give faster experience than making Air Runes, but if you do want to craft Mind Runes, there are plenty of options to choose from. 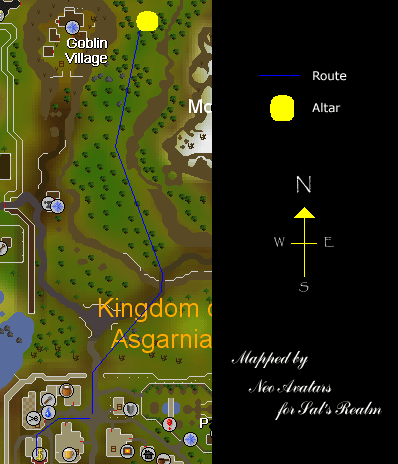 The altar can be found slightly south of the Wilderness to the west of the Black Knights' Fortress, and east of the Goblin Village. When trying to enter the altar, if you are coming from the south you may accidentally walk into the Wilderness since it is so near, so be careful. Unlike the Air Altar, the inside of the altar is a dungeon, where the crafting altar is a long way away from the entrance portal. For each Essence that you turn into Mind Runes, you will gain 5.5 Runecrafting experience. Other Requirements: Heroes Quest complete so that you can charge your Glory Amulets. 5+ Glory Amulets is suggested so that you don't spend all your time charging them. 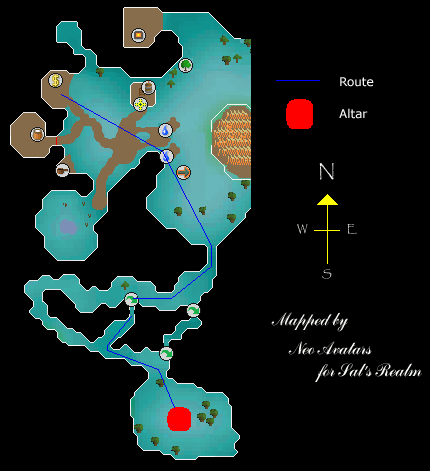 This route goes into level 4 Wilderness, so beware of Pkers. Other Requirements: Level 37 Magic is required for Falador Teleport. 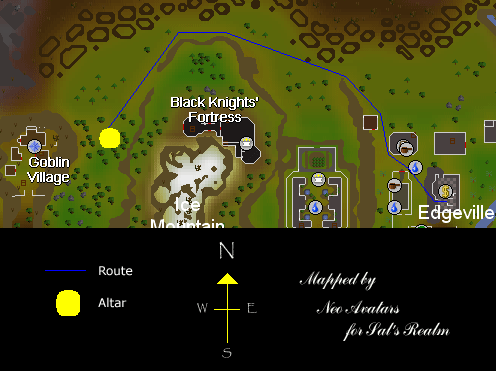 Other Requirements: This route goes into level 4 Wilderness, so beware of Pkers. 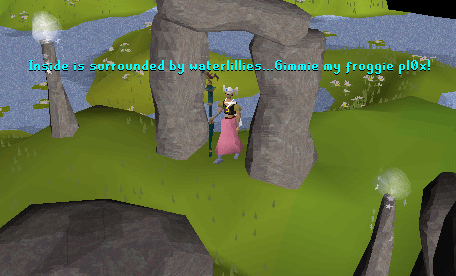 At level 5 Runecrafting you get the ability to craft Water Runes. Just like with Mind Crafting, there are very few ways that will obtain faster experience than can be gained by crafting Air Runes. If you are a Member then there are lots of different routes that you can choose from, but if you are a Freeplayer, there is only a single route that can be used to get anywhere near good experience. 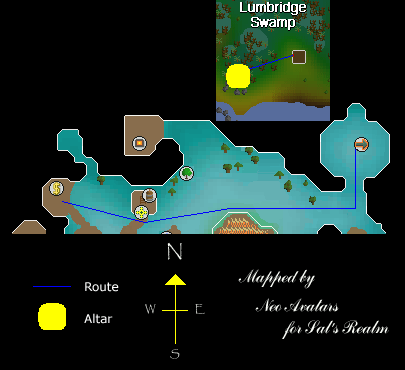 The altar can be found in the southern part of the Lumbridge Swamp, to the west of the building which is the entrance to Zanaris. The altar is tightly surrounded by trees and all the water near it is so muddy and dark, it's hard to work out why it is located where it is. Once you are inside it's more obvious why the altar crafts the kind of Runes it does. Located on an island in a lake full of waterlillies, it's the perfect location to craft Water Runes. For each Essence that you turn into Water Runes, you will gain 6 Runecrafting experience. Members?This route is available for all to use. Other Requirements: Level 29 Agility is required to use the Agility shortcut. Level 31 Magic is required for Lumbridge Teleport. Must have completed at least part 1 and one other part of the Recipe for Disaster Quest for access to the Bank Chest. Other Requirements: Lost City Quest complete to access Zanaris. At level 9 Runecrafting you get the ability to craft Earth Runes. These are good experience, but hard to sell if you need to cover the costs of the Essence that is used. There are only two routes that are used to craft these Runes, so if you wish to make them, there isn't much decision making to be done. The altar can be found to the south of the Lumber Yard, just west of the start of the path to Morytania. The altar is slotted in between the trees with a Yew Tree to the south. Once inside the altar you will have to climb up a hill, a pile of mud, to get to the altar to craft your Runes. For each Essence that you turn into Earth Runes, you will gain 6.5 Runecrafting experience. Other Requirements: Level 25 Magic is required for Varrock Teleport. At level 14 Runecrafting you get the ability to make Fire Runes. If you are a Member, these can provide some of the best experience available in the game, and a large number of different routes to choose from. Once again, if you are a Freeplayer, there is only one route which you can choose from. The altar can be found just to the north of the entrance to the Duel Arena. The altar is positioned at the top of a slight incline in the gradient of the ground, with Cacti viewable when you are standing beside it. Once inside the altar, you will find another hill. This hill appears to be the inside of a volcano or something like that, so make sure you don't slip and fall into the bubbling magma! For each Essence that you turn into Fire Runes, you will gain 7 Runecrafting experience. Other Requirements: A good supply of Rings of Dueling is required so that you don't run out part way through Crafting the Runes you want. Route 18 also uses exactly the same amount of equipment, so it is suggested that you use that one rather than this. A good supply of Rings of Dueling is required so that you don't run out part way through Crafting the Runes you want. At level 20 Runecrafting you get the ability to craft Body Runes. There is a very small market for these Runes, and they are rarely traded, so it is recommended that you only craft them if you wish to use them yourself, even though the experience gained by crafting them can be great. The altar can be found south of the Prayer Guild, west of the Barbarian Village Pub, and east of the Ice Mountain entrance to the Dwarven Mines. The altar can be found on top of a hill surrounded by Evergreen Trees. When you enter the altar, you will appear to the north of the altar on which you craft runes. 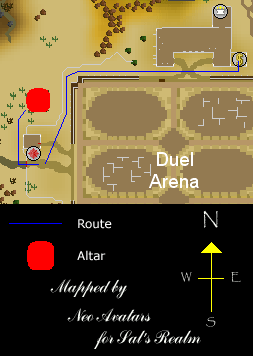 If you look at the mini-map you will see that the shape of the altar is a heart! When you want to leave the portal can be found just south of the altar. For each Essence that you turn into Body Runes, you will gain 7.5 Runecrafting experience. Other Requirements: Legend's quest for recharging bracelets, 5+ bracelets to prevent having to spend so much time charging. Other Requirements: Spare parts for the sceptre when the first is used up, since you can only have one at a time. At level 27 Runecrafting you get the ability to craft Cosmic Runes. To get to the altar you must have completed the Lost City quest since it can be found within Zanaris. Because the altar is in a Members only location, Freeplayers don't have the ability to craft these Runes. 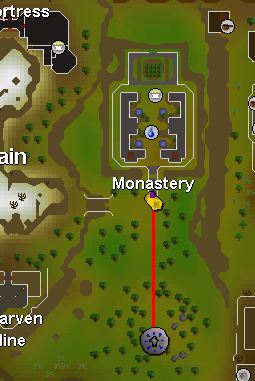 When crafting, your Agility level will drastically affect the rate of experience that you can get because of the different level Agility shortcuts found between the bank and the Altar. The altar can be found in the most southern part of Zanaris. The altar can be found to the west of some Fungi, which when picked will turn into the Slayer monster - Zygomites. There are also several Trees around. Inside the altar is completely different. There are four entrances, one on each point of the cross. Between the portals and the altar in the middle are bridges, that are invisible so that it looks like you are floating! There are also Magic looking things that fly across underneath the altar. For each Essence that you turn into Cosmic Runes, you will gain 8 Runecrafting experience. Level 66 Agility is required to use the Agility shortcut. 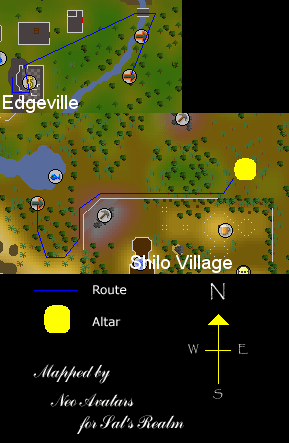 Level 46 Agility is required to use the Agility shortcut. At level 35 Runecrafting you get the ability to craft Chaos Runes. These provide slow experience due to the long distance between the bank and the altar. Freeplayers don't have the ability to craft these Runes. 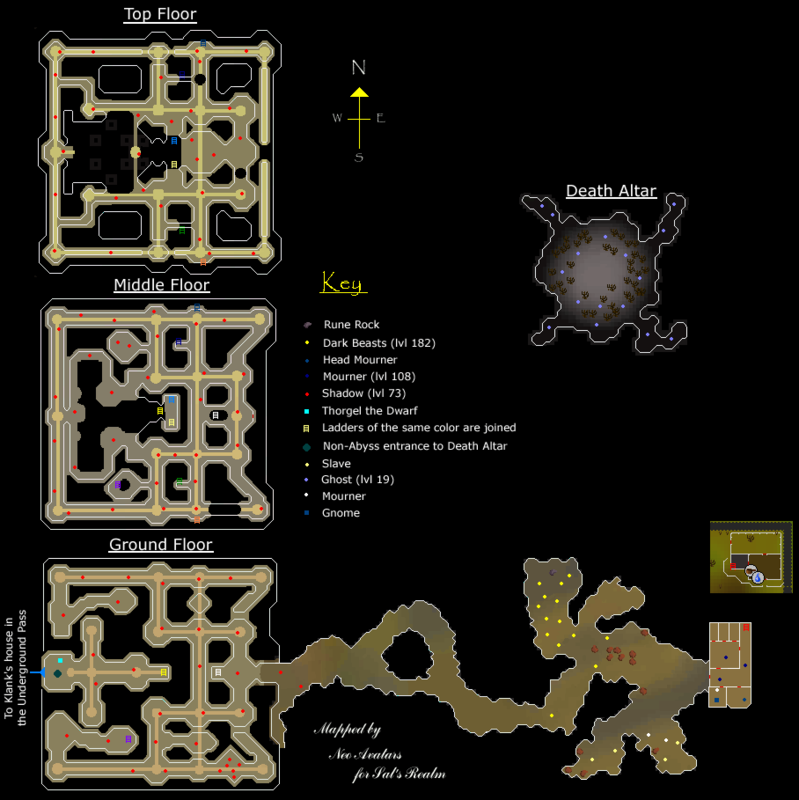 The altar is also situated on the border between level 9 and 10 Wilderness, just southeast of the Dark Warriors' Fortress. 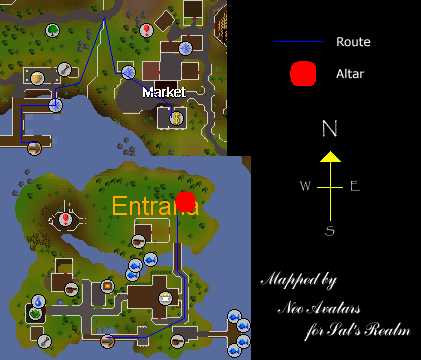 To get to the altar, head north from Edgeville until you get to the hill with the Obelisk of Air on the top. Once you reach that, head north-west and you will get to the altar. When you enter the altar you will appear on a platform which is connected to other platforms by bridges, and have a view of the altar down below. 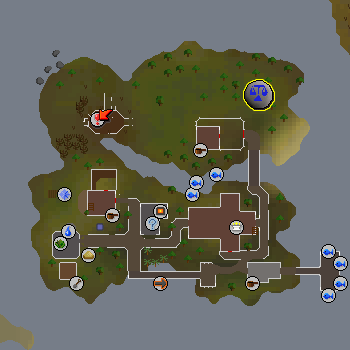 A map of the maze can be found in the Runecrafting guide. After making your way through the maze, which will take several minutes, you will finally reach the altar and be able to craft your runes. For each Essence that you turn into Chaos Runes, you will gain 8.5 Runecrafting experience. At level 40 Runecrafting you get the ability to craft Astral Runes if you have completed the Lunar Diplomacy Quest. These Runes are used to cast the Lunar Magic spells. Because the altar is in a Members only location, Freeplayers don't have the ability to craft these Runes. The experience gain from crafting these Runes can be fairly large, and the great thing is that you don't need a Talisman or Tiara to craft them! The altar can be found on the southern peninsula of Lunar Isle. On your way from the bank to the Altar you will encounter level 111 monsters, so running past them is highly suggested. When you reach the altar, you may notice that there is an extra option to Pray at the altar. When you choose this option you can activate and deactivate the Lunar Spellbook. Since this is the second option, it isn't a problem while Runecrafting since you are still able to left-click the altar to craft your Runes. For each Essence that you turn into Astral Runes, you will gain 8.7 Runecrafting experience. Other Requirements: Lunar Diplomacy Quest complete to access Lunar Isle. Level 69 Magic is required for Moonclan Teleport. If you have level 70 Magic, use Tele Group Moonclan since you will gain 1 Magic experience more per Teleport, and if you have a Staff with Earth Rune properties equipped, you won't use any extra Runes up. At level 44 Runecrafting you get the ability to craft Nature Runes. These are crafted very often due to the huge profits that can be made. If you buy the Pure Essence for 100 gp each, then sell the Runes for 330 each then you are making 230gp per Rune, and if you make 1300 Runes per hour, which is easily done with certain methods even at level 44, that's 276,000 gp profit within only 60 minutes! Because the altar is in a Members only location, Freeplayers don't have the ability to craft these Runes. If you want money from Runecrafting, these are what you should craft. 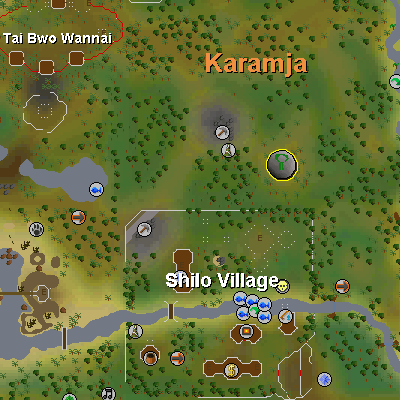 The altar can be found slightly north of Shilo Village on Karamja. Around the Altar are lots of Monkeys that do nothing other than run around and get in the way. You could kill them for fun, but that would be mean. Once you enter you will be on a hill with lots of flowers and trees around it. It's just like being in the countryside, but then you realize that you're actually looking at a computer screen! For each Essence that you turn into Nature Runes, you will gain 9 Runecrafting experience. 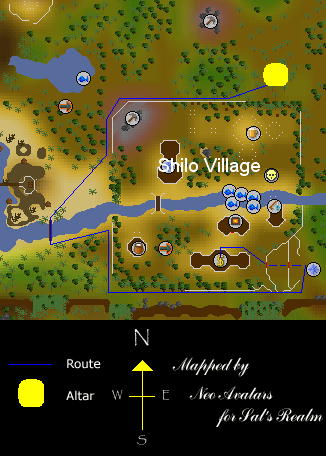 Other Requirements: Shilo Village Quest complete to access Shilo Village. Grand Tree Quest complete for use of Gnome Gliders. Fairy Tale Part 2 started for use of Fairy Rings. Other Requirements: Fairy Tale Part 2 started for use of Fairy Rings. 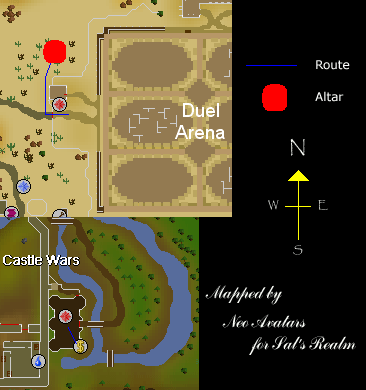 Route Summary: Castle Wars bank > Break tablet to the altar > Altar > Ring of Duelling to Castle Wars. At level 54 Runecrafting you get the ability to craft Law Runes. To get the Law Talisman to enter the altar you must complete the Troll Stronghold Quest. Law Crafting is famous around Runescape due to companies like the World 66 Fast Free Laws Company. Because the altar is in a Members only location, Freeplayers don't have the ability to craft these Runes. The altar can be found in the north-east corner of Entrana. Since you can't bring Weapons or Armour to Entrana, things like Legends Capes cannot be worn while crafting Laws. This may be a huge problem if you are concerned about fashion, but there are plenty of types of Robes that can be worn on the island like Pink Skirts! 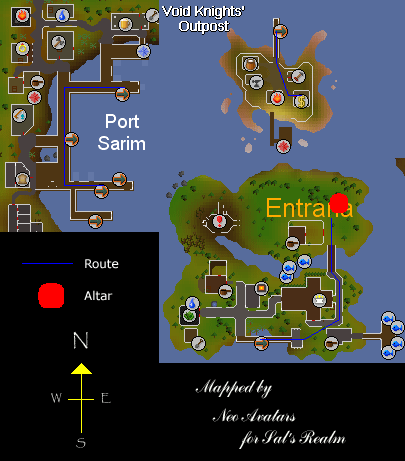 Once inside the altar you will have to walk quite a long way until you reach the altar to craft your Runes on. There is also a large symbol on the floor, the same symbol that can be found on Law Runes! For each Essence that you turn into Law Runes, you will gain 9.5 Runecrafting experience. Troll Stronghold Quest complete to obtain Law Talisman. Other Requirements: Troll Stronghold Quest complete to obtain Law Talisman. Other Requirements: Level 26 Agility is required to use the Agility shortcut. Level 37 Magic is required for Falador Teleport. Other Requirements: Enlightened Journey for the ability to use Hot Air Balloons. 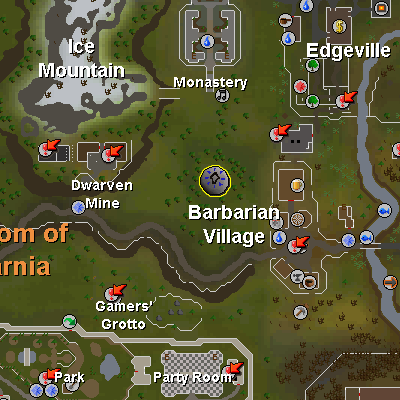 Other Requirements: Troll Stronghold to obtain the law tailsman, Enlightened Journey to be able to use the air balloons, and the Zamorak Mage mini-quest to obtain the pouches. At level 65 Runecrafting you get the ability to craft Death Runes if you have completed the Mourning's Ends Part 2 Quest. 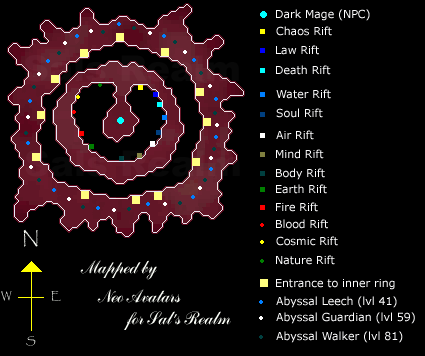 The altar can be found within the Temple of Light at the location called "Non-Abyss entrance to Death Altar" on this map. When you go through the Door to the Altar entrance for the first time you will see a cut-scene in which the camera will go right down and Thorgel the Dwarf will appear. At every other time that you enter the room, you will walk in normally and have the ability to either enter the altar or go out through a passageway that leads into the Underground Pass. 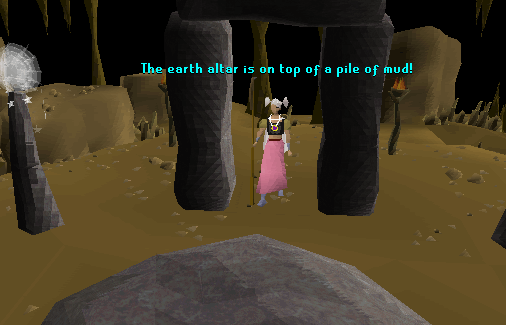 When you enter the altar you will probably notice something in it that no other Runecrafting altar has. This thing is monsters. The altar is full of level 19 Ghosts that you could kill if you wished to do something slightly different when Runecrafting. For each Essence that you turn into Death Runes, you will gain 10 Runecrafting experience. 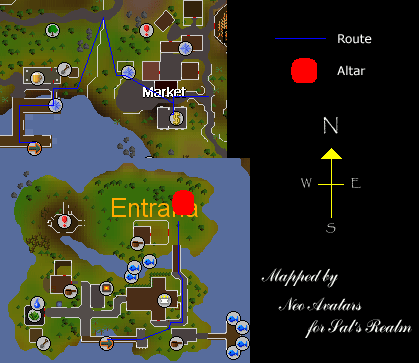 Due to the fact that the Temple of Light is so large and the nearest Bank is in East Ardougne, it is highly suggested that you don't craft Death Runes using any normal methods. There is one route that can be used, one that can be used to craft any other Rune that requires a Talisman, through the Abyss. At level 77 Runecrafting you get the ability to craft Blood Runes. They have much in common with death runes: They both require a very long line of quests to craft, and in both quests you visit the altar and get the talisman, and both altars are also extremely far away from a bank. This time Legacy of Seergaze is required, and the entrance is located in the Meiyerditch Dungeon in the city (or maze) of Meiyerditch. There is also an entrance to the Meiyerditch Dungeon in the tunnel beneath the Hair of the Dog Inn located in southern Canifis. If you have done the quest, you probably remember that you had to fight two Vyrewatches in a deep cave full of high-leveled slayer monster, and your character said that the strange stones in the cave looked familiar. As you probably guessed, those stones were the entrance to the blood altar. For each Pure Essence that you turn into Blood runes, you will gain 10.5 Runecrafting experience. At first glance it may look impossible to craft blood runes outside the abyss, but it's not. Because the Meiyerditch dungeon actully has a side entrance that goes out in Canifis! For maps and directions of this, see one of the routes below. Other Requirements: Legacy of Seergaze to gain access to the altar, Desert Treasure and 66 magic to use Kharyll Teleport. Equipment: Blood Tiara, earth or air staff to save an inventory space. Other Requirements: Legacy of Seergaze to gain access to the altar, Desert Treasure, 66 magic and 50 construction to make a Kharyll Portal. The Abyss is one of the best ways to Runecraft there is for Members. With all the altars equal distances away from the bank and the ability to carry extra Essence on each trip, this is something that should not be ignored if you have the ability to use it. 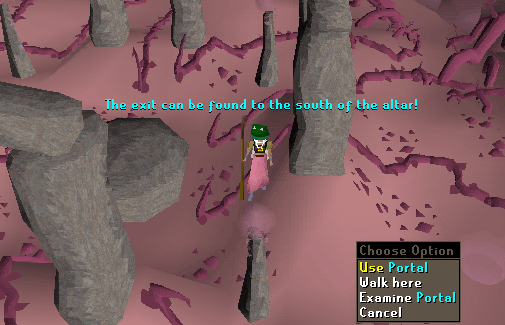 To be able to access the Abyss, you must complete the Zamorak Mage Mini-Quest. Once the Mini-Quest is complete you will want to make sure that you have the correct items for making as many Runes as possible. When talking Abyss Crafting, the first thing that will appear in the minds of many people is the fact that you can use Pouches. There are four different types of Pouches, each one requiring a different level to use and being able to hold a different number of Essences. The Small Pouch is given as a reward from the Mini-Quest, and the others can be obtained as drops off the monsters in the Abyss. Try killing the level 41 monsters because they only have 10 hp, while the level 59 hits high, and the level 81 has a very high Defence level. You can only have one of each type of Pouch at a time and to get the higher level Pouches you must already own the lower level ones. This means that you must have a Medium and Small Pouch to be able to get a Large Pouch as a drop. You can own a Pouch, even if you don't have the level to use it. As you use the Pouches, they will slowly degrade, meaning that they can carry less Essence. To stop them degrading you must speak to the Dark Mage who can be found in the center of the Abyss. When you talk to him, he will say that he is busy and you will get four options to choose from. Select the bottom option, "I need your help with something...", and he will ask you what you need help with. You will now have two options. Choose the bottom option again, "Can you repair my Pouches? ", and he will repair your Pouches for you. If you do this every 8 times to go through the Abyss, 2 Fully Charged Glory Amulets, then your Pouches won't degrade and you will get full use from them all the time. The Abyss is a dangerous choice. 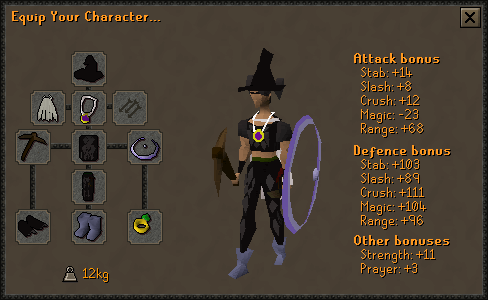 You could get PKed on your way to the Zamorak Mage who Teleports you to it, and once inside it is full of monsters up to level 81 in a Multi-Combat zone. You will also get a skull above your head as if you attacked somebody in the Wilderness and your Prayer will be drained to 0, so if you die you will lose everything. Due to these dangers, you need to know about what sort of equipment will protect you well against them. Your armour is what will protect you from the attacks that are aimed towards you, so getting it right is vital if you want to keep your precious items. Helmet - In this spot should go either a Blue or Black Wizards Hat. They give a +2 Magic Defence, making Magic spells slightly less likely to hit. They also cost very little so are easy to replace if you do unfortunately die. If you've completed the Elemental Workshop II Quest, you can bring a Mind Helm, which adds +6 to Magic Defence. The other item which could be worn on your head is the Coif, which can be bought for 200 gp from the Champions' Guild. 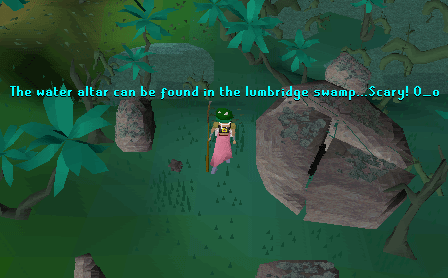 Amulet - In this spot should be an Amulet of Glory so that you can Teleport back to Edgeville once your Runes have been crafted. Once all your Amulets have run out of charges, you will need to head to the Heroes Guild to charge it. The quickest ways to get there being either using the Games Necklace to teleport to the Games Room or, if your house is in Taverley, teleporting to your house, then walking from there. Cape - In this spot there are a couple of options. The Legends Cape can be cheaply bought from the Legends Guild and gives several Defence bonuses. If you aren't a Legend then the God Capes from the Mage Arena give a +10 Magic Defence. Weapon - Once inside the Abyss you will need to get through the inner ring. 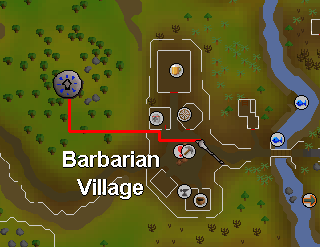 Where you enter there will either be an Agility or Mining obstacle to get past nearest to you. Bring a Pickaxe incase it is Mining. By making it Bronze, it is less likely to get looked at by PKers and the difference between Bronze and Rune is minimal. Body - The best Dragonhide Body you can wear. It is lightweight and provides good Defence against Magic attacks. It also has reasonable Melee Defence so the monsters inside the Abyss will be less likely to hit you than without any armour. Shield - The Elemental Shield can be obtained during the Elemental Workshop Quest and has a Magic Defence Bonus. If you've completed the Elemental Workshop II Quest, you can bring a Mind Shield which adds +9 to Magic Defence. Gloves - The best Dragonhide Vambraces you can wear. It is lightweight and provides good Defence against Magic attacks. It also has reasonable Melee Defence so the monsters inside the Abyss will be less likely to hit you than without any Armour. Legs - The best Dragonhide Legs you can wear. It is lightweight and provides good Defence against Magic attacks. It also has reasonable Melee Defence so the monsters inside the Abyss will be less likely to hit you than without any Armour. 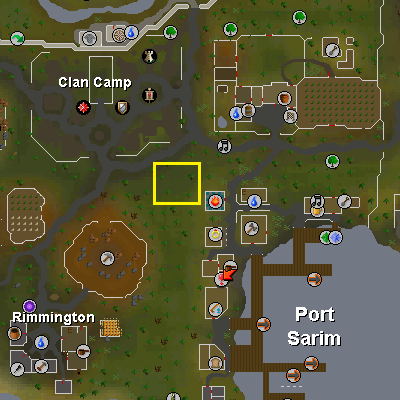 Falador - If you have the Gaze of Saradomin from the Recruitment Drive Quest, you have to option of setting Falador as your respawn point. Camelot - If you've finished the Knight's Training Ground Activity, you have the ability to set your respawn point to Camelot. Boots - Wear Boots of Lightness. They lower your weight by 4kg, meaning you can run for longer. All this is not vital when crafting, and it is possible to do it without any Armour on if you have a high Defence level, but you are more likely to die if you get Teleblocked and Entangled by a Pker. If you are crafting Law Runes through the Abyss, you cannot take any Armour or Weapons into the Altar, so it is more dangerous, and slightly slower since you will have to find entrances to the inner ring that don't need a weapon to get past. Choosing your inventory is a lot easier than your equipment because there is much less choice. Pouches - Bring all the Pouches you can use, making sure that they are full of Essence. The more Pouches you use, the more Runes you can craft on each trip and the more experience and money you can make. One-Click Teleport - There are several items that could be used here including the Lletya Teleport Crystal, Ectophial or Teleportation Tablets. The Lletya Teleport Crystal can be obtained by killing Elves and the Mourning's End Part 1 Quest. When you choose to Teleport, you will appear in the center of Lletya. The Ectophial can be obtained from the Ghosts Ahoy Quest and will Teleport you to the Ectofuntus. 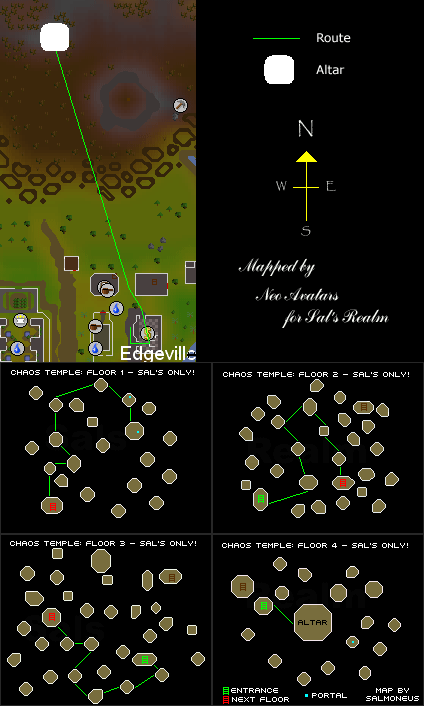 Teleportation Tablets can be created on a Lectern in the Study of your POH. 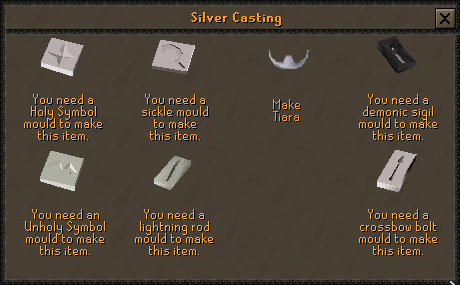 If you choose these, Falador Tablets are the best since the Teleport is nearest to a Bank, which you can go to if you become poisoned by a PKer. Another option is a House Tablet which will send you to your house where you can wait to die if you are poisoned. If you think you have enough health left to survive, you can also use a mounted Glory Amulet to get to Edgeville where you can bank. 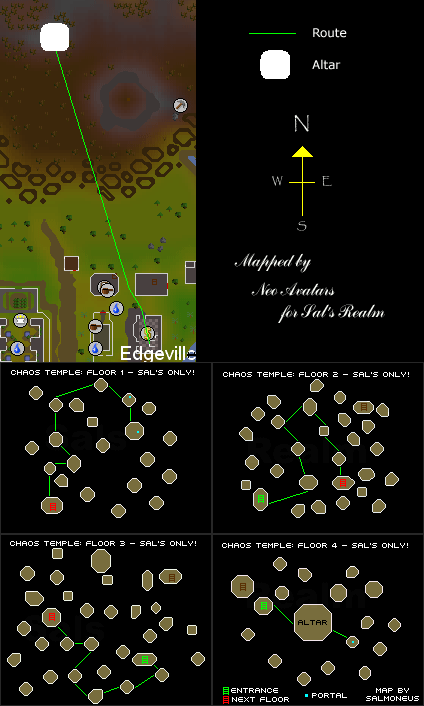 Out of the many choices of One-Click Teleports, it is suggested that you use either a Lletya Teleport Crystal or Falador Teleportation Tablet to fill this spot. When you have it in your inventory, try to keep it near the center so that you don't accidentally press it when you are trying to view something like your Stats or Friends List. Essence - Fill the rest of your inventory with either Rune Essence or Pure Essence, depending on which kind of Rune you wish to craft. Now you have all the equipment needed to craft Runes through the Abyss, you will want to start crafting your Runes. Before you start, having either the Heroes Quest or Desert Treasure complete will help you a lot. There are two main methods people use to craft via the Abyss which are using Glory Amulets and using the Paddewa Teleport. When you use the Glory Amulet Teleport to Edgeville, you will appear slightly to the east of the bank, and be able to walk straight into the bank, store your crafted Runes, and withdraw some more Essence. If you use the Paddewa Teleport then you will need the Ancient Magic Spellbook and 54 Magic. You will also need to swap three of the Essence in your inventory for 2 Law Runes, 1 Fire Rune and 1 Air Rune. 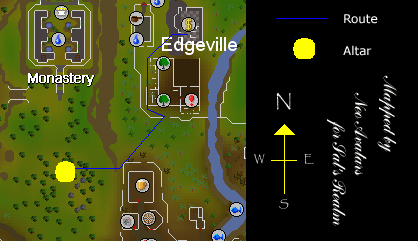 When you cast the Paddewa Teleport you will appear within the section of the Edgeville Dungeon that is very slightly north of the entrance from Edgeville within the area shown in the image below. 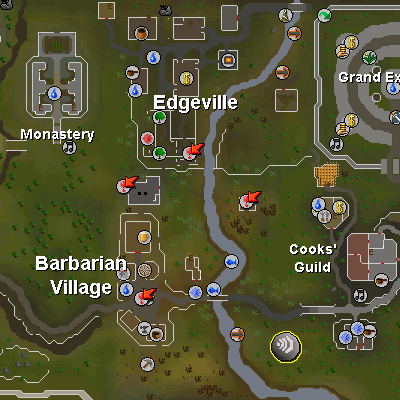 From Edgeville Bank you will need to make your way to the Zamorak Mage, who wanders around between level 4 and 6 Wilderness. There are two routes that you can take to get there. The first is shorter, but more dangerous because it is where the PKers hang around before sniping down on you and attacking. This involves going north of the bank, and heading into the Wilderness, staying on the west side of the river. To make this slightly safer, stay close to the River so that the Skeletons will attack you and, because it is a single combat zone, the Pkers won't be able to. If you want a slightly safer, but longer route then you can head to the bridge that crosses the River, cross it, and head up the east side of the River. 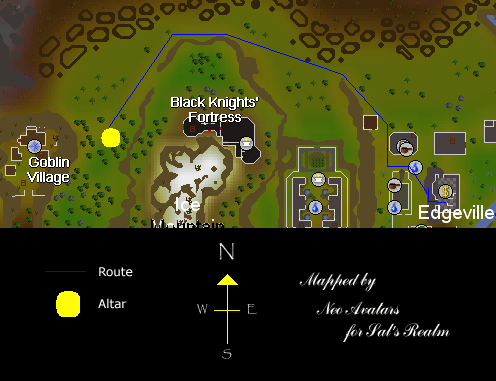 Since most Pkers don't look in that direction, you will be a lot safer. All these routes can be seen on the map below. When using the Abyss, if you don't use Energy Potions to keep your energy topped up, you should only run within the Wilderness and the outer ring of the Abyss. This means that while you are at other stages of the route, your energy will re-generate back up to the stage it was before. If you find that your Energy is too low then you could drink some Energy Potions, train another skill for a short amount of time while it heals or wait on the edge of the Wilderness, watching to see if any PKers enter. When in the Wilderness, always watch out for people standing around to the west of the source of the River Lum. Often these people are PKers, and they can see you before you see then since they stand on a hill, by watching your Mini-Map you will be able to see when somebody is waiting there early because they will show up as a white dot. If you do go past and somebody is standing there and they don't attack, check their combat level. If it is within 6 levels either side of yours, change worlds incase they attack you on a future run. Inside the Abyss sounds terrible, but isn't if you know what it looks like, and its shape, it is easier to work out how fast you want to get out of the area you are in. The south of the Abyss is packed with level 81 monsters, which will hit hard when they do hit, but don't hit very often. The east and north-east parts are full of level 59 monsters. These will hit high, and often, so beware while in this area. The west and north-west parts are full of level 41 monsters which will hit lots of 10's and 20's, but aren't hugely dangerous. All the monsters can be found all the way around the Abyss, but seem to be grouped as stated above. When you enter, the nearest entrance to the middle will be blocked, but the one on either side will be either an Agility obstacle to get through or a pile of rocks which you must mine to get past. If you try to walk around there will be other obstacles which require Firemaking, Woodcutting and Thieving to get past. There is also a gap that you can walk straight through, but that is always on the opposite side to the one that you enter on, so using one of the other obstacles is suggested. While trying to get through an obstacle, there will be monsters attacking you. If you manage to get through, the damage that is hit will not affect your Life Points, but if you fail all the damage that was hit on you will cause damage and you will have to try again. Once on the inner ring, you can find the Rift of the type of Rune you wish to make and enter it, or if you wish to repair your Pouches, talk to the Dark Mage. Each trip through the Abyss from the Bank, through the Abyss, crafting your Runes and getting back to the Bank takes around 90 seconds. This means that you can make 40 trips an hour and with Pouches, can turn 2120 Essence into Runes per hour at level 75 Runecrafting, 1680 with 50 Runecrafting, 1320 with 25 Runecrafting, and 1200 with only level 1 Runecrafting! This is great experience and the risks involved are certainly worth the effort. Although it may sound like everything to do with Runecrafting has been explained, there is another method that is better experience for both Freeplayers and Members than any described earlier on in this guide. This method is hiring runners. Many people will have heard of companies like Fast Free Laws, this is just a large example of hiring runners. The crafter stands around in the altar, while the runner runs between the Bank and the altar. Of course people don't do this running for free, and the crafter will have to pay a price for good experience, but experience from these companies can be huge. There is one large Freeplay Company, World 16 Airs, and several Members ones like The Law Company World 66 and Fast Laws Inc of 99. These companies normally have threads on the Official Forums explaining the latest information about the company, but some have threads that are there for a few weeks, then die out while the company lives on. One of these examples of a company existing by word of mouth is World 16 Airs, which can provide the fastest experience that Freeplayers can get. Members can also get fast experience as well. At low levels, money will be lost very fast using this company, but at higher levels experience will be obtained just as quickly, but money can be made at the same time. At full speed, you can craft 4500 Essence in an hour. This is a staggering 22,500 xp in a single hour! This can be done because of the large numbers of Freeplayers who need money, and have heard through others about this company. How you do it is very easy. Lots of money. It is suggested that you have at least 500,000 gp since even that amount will only last around 90 minutes when you are crafting at full speed. As much Essence as you have money for. Before arriving you will need to decide how much you are willing to pay the runners for un-noting Essence for you. If you pay 1500 gp then you will get slow experience and very little trade. If you pay 2100 gp you will take 5-10 minutes to get up to full speed, then will be crafting at a speed of about 4500 Essence per hour. If you pay 2500 gp then all the runners will come to you as soon as they hear your price and you will get up to speed very fast. To work out how much Essence you need, divide the amount of gp you are going to bring by the payment you are willing to give, then multiply by 25. A kind personality. If you are mean whenever somebody trades slowly or keeps asking you questions, people won't want to trade with you. When you first arrive at the altar you should advertise the fact that you are crafting Runes, and how much you are willing to pay. If I was paying 2100 gp for somebody to un-note my Essence, I would say something like "Open 2.1k ~ Neo". This lets the runners know that you are open to craft, how much you are paying, and who is crafting if it is too busy to see the Public Chat in the box. Turn Public Chat to "Hide". This lets you see people talking, but also makes it easy to accept trades. When somebody trades you, left-click on the trade offer to accept it. If you didn't accept the first person to trade you, don't worry - you're here for experience, not to make friends. Right-click on your pile of money and choose to "Offer-X". Enter the amount of money you are paying and press the Enter key to put the money into the trade. Right-click on the noted Essence and those to "Offer-X". Enter the number "25" and hit Enter. Make sure that the person you are trading with has put up 25 Unnoted Essence, then accept the trade. Craft the Essence into Runes. Repeat steps 3-7 until you run out of money. Each cycle should take around 20 seconds at full speed, which is 180 trades in an hour. It is also possible to pay in Air Runes, but since Runners need to sell them, so experience is slower than by paying in cash. At certain levels you can make more than 1 Air Rune out of each Essence. Because of this, it is difficult to work out how much money you will make or lose on each trade, or even all the way from level 1-99. To make it easier to work this out, here are some tables that will tell you the profit or loss you will make on each trade at certain Runecrafting levels. All the numbers assume that you buy your Essence for 20 gp each, so for every gp more than this that you pay, you should take 25 gp away from the number to work out what your real profit or loss is. For the final table, it shows the profit or loss you make going all the way from level 1-99, so for each gp more than 20 you buy Essence for, you should take away 2,606,900 from the result to find the true cost. If you pay anything other than 1500, 1750, 2000, 2100, 2200, 2300, 2400 or 2500, or sell Air Runes for less than 15 gp or more than 20 gp, you will need to change the numbers slightly, but since they are the most common values used, they are what is in the tables. There is a very detailed guide available here about the company if you wish to learn about it or use it to craft Runes. Much like, the Air Company, at full speed you can do a trade within 20 seconds, making it possible to craft 4860 Pure Essence in an hour. The problem with this though is that your Run Energy will lower since there is a distance between the altar and the Portal, and the runners wait outside. This means that you can only craft about 4000 Essence in an hour when working at full speed. At 9.5 experience per Essence, this is 38,000 xp in an hour. You can only lose money with this company because you give away all the Runes that you craft, and you provide the Essence too. This is fast experience, and a very fast money waster! Whenever you trade with somebody, make sure that the Essence that they are giving you is Pure Essence, not Rune Essence otherwise you will not be able to craft the Runes, and will have to bank to get some more Law Runes or Essence to trade the next person. This company is very similar to the one on World 66. The difference is that on World 99, the runner provides the Essence rather than the crafter and the Robes are a different color. This means that the crafter doesn't make or lose any money, but due to runners not wishing to provide their own Essence, experience here is a lot slower and you will be lucky if you get more than about 2000 Essence Crafted in an hour. When using these Law Companies, it is suggested that you look for a thread in the Runes section of the Official Forums to make sure that nothing has changed and you aren't breaking their rules. The ZMI Altar is a method that can give masses of experience extremely easily, although obviously with some strange forces in action. It can be found in a dungeon north of Castle Wars near to the Red Salamander Hunter area. In the basics, it's just like any of the other Altars, where you craft Essence into Runes, although the Zamorakian forces around mean you get some unusual effects. To use the Altar you must have Pure Essence since ordinary Rune Essence will do nothing. When you craft this Essence on the Altar, it could turn into absolutely any of the different Runes, although the higher your Runecrafting level, the higher level Runes you are likely to get. This means that if you have level 80 Runecrafting you will get a lot more Nature, Law and Death Runes than somebody with level 40 Runecrafting. Due to this fact, you will get a lot more experience at higher levels than at lower levels. To compensate for the randomness, the normal experience for Runes is doubled, so you will get twice as much experience as you normally would. When you enter the dungeon you will find yourself with an immediate descision to make as to whether you want to take the long or short (safe or 'dangerous') route. The long, safe route means heading east at the fork in the path, before following a winding path to get to a Crack in the wall that you must climb through to get to the altar. All of these monsters are aggressive, although the maximum hit that they can do is 90 Life Points of damage, and by putting on the relevant Protection Prayer, you can stop the majority of the damage. You can also put on the Rapid Restore Prayer to speed up the rate at which your Life Points heal. To restore any lost Prayer Points, there is also an Altar just outside the dungeon that you can Pray at, so keeping 'unnecessary' Prayers on won't make much impact in cost and speed. To lower the number of monsters that attack you due to there being more people around to spread the damage, heading to World 70 will help. When taking the short path, once you have passed the Pillars surrounding the Altar, any monsters attacking you will stop, and stay out of the area unless somebody attacks them, dragging them in. 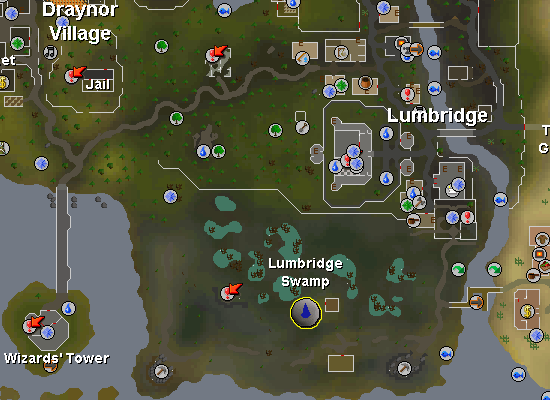 There are two main routes that are used to craft Runes at the ZMIA, one requiring you to have completed the Lunar Diplomacy Quest and have level 71 Magic, while the other requires you to have large numbers of 'junk' Runes that you are willing to give away. This Route makes great use of the Lunar Spellbook, and more specifically the Ourania Teleport, which requires 2 Astral Runes, 1 Law Rune, and 6 Earth Runes to cast, giving you 69 Magic experience in the process. To save large numbers of Earth Runes, it is suggested that you equip either an Earth, Lava or Mud Staff. 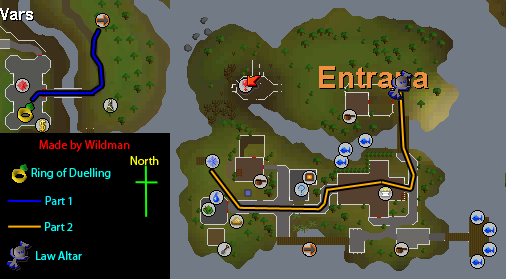 The general idea of this route is that you Teleport to Ourania, enter the Dungeon, take the route of your choice - preferably the short one - craft your Runes, and Bank. To Bank, it is recommended that you cast a Moonclan Teleport, although with lower Runecrafting levels you won't craft enough Astral and Laws to keep both this Teleport and the Ourania Teleport going. 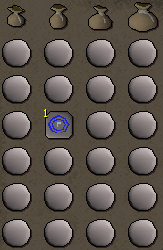 If this is the case, you could either make some of those Runes individually, or Bank somewhere else easily accessable such as Castle Wars with a Ring of Duelling. As with all Runecrafting, you can choose to use the Pouches found in the Abyss. This will help you make lots more Runes than you could do otherwise, and the Abyss can still be acessed fairly eaily when on the Lunar Spellbook via a Glory Amulet Teleport. With 75 Runecrafting, Energy Potions to keep up Energy, taking the short but 'dangerous' route, and Lunar Teleports, it's easily possible to get 25,000 experience per hour along with Runes to give a profit just over 100,000gp, which isn't as much profit as Abyss crafting, but the experience is certainly better! Within the Dungeon there is a Bank near to the entrance, which you can use to withdraw Essence from. 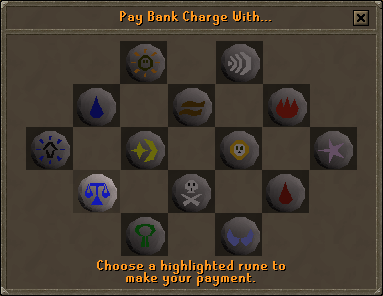 The problem here is that you need to pay 20 Runes each and every time you wish to view your Bank. If you are using Pouches, this can mean you may need to view your Bank up to 3 times every run, which means you will be giving out 60 Runes every run, and profits will be down a bit even if you use cheaper Runes such as Elemental and Body Runes. If you are trying to keep combat down to the extreme, this Banking method along with taking the short route will be required for you to make use of the Altar. Now that you know all this detailed information about the skill, here is a summary explaining the best way to gain experience. At this point you have very few choices. If you want good experience, then you have to craft Air runes. Trying to change to Mind or Water Runes is a bad idea since even using Route 3, you can gain 4666 xp per hour, while with Mind or Water Runes, the best you can get is 4596 xp per hour, and that requires you casting two Teleportation spells on each run, making your costs even higher. If you have 37 Magic, it is suggested that you use Route 2, since you can get 800 xp per hour more using that method rather than Route 3. Your profits will be slightly lower, but if you have the level and the money to do so, you will be pleased you did it. At level 9 you get the ability to craft Earth Runes. By switching to these, your hourly experience will increase to 5200 or more depending on whether you choose to use Route 16 or Route 17. The experience difference between the two is 605 xp per hour, which is less than the difference between the Air Routes, but with the cost of Teleport Runes, and the fairly low price of Earth Runes, profit will be low. If you cannot afford to lose money, then you should carry on crafting Air Runes, but if you have money to spare then changing to Earth Runes is a good choice. At level 20 you can make the best thing possible for Freeplayers, Body Runes. There is a very small market for buying these Runes, so you should only craft them if you need them for use yourself, or have money that is just sitting around in your Bank and you want to use for skills. With Route 26, you can gain 6517 xp per hour, which is another 600 xp per hour more than it is possible to get with Earth Runes, and nearly 2000 xp per hour more than crafting Air Runes. If you can't afford to lose money, and want to make a profit then you should make Air Runes with either Route 2 or Route 3. If you are willing to just about cover your costs, and maybe make a small amount of money, then craft Earth Runes using Route 16 or Route 17. If you have lots of money to spend, need experience and don't care about losing large amounts of money, craft Body Runes using Route 26. At higher levels if you have large amounts of cash to start with, the World 16 Air Company will provide Freeplay crafters with experience faster than using any other way. It can also be used at lower levels, but cash will be lost very fast. There are a lot more ways for Members to train than there are for Freeplayers, and often the experience is slightly higher. 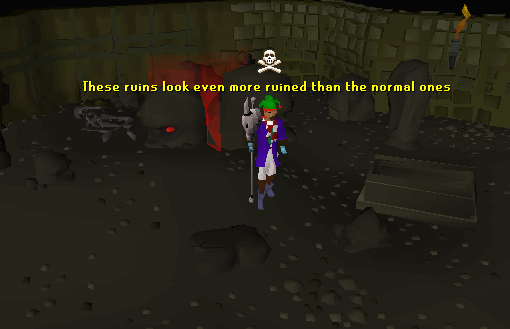 At all Runecrafting levels, if a route that you are using takes more than 90 seconds, you will be able to get more experience crafting through the Abyss, and from level 50 there is no reason not to use it if you have a high enough Defence level to do so. If you are crafting Freeplay Runes, you should always use Rune Essence rather than Pure Essence because you will save large amounts of money by doing so unless you want a small boost in experience by either using a Runecrafting company or the ZMI Altar. At this point, just like Freeplayers you only have one choice - Air Runes. If you want good experience, then you have to craft Air runes. Trying to change to Mind is a bad idea since even using Route 3, you can gain 4666 xp per hour, while with Mind Runes, the best you can get is 4596 xp per hour, and that requires you casting two Teleportation spells on each run, making your costs even higher. If you have 37 Magic, it is suggested that you use Route 2, since you can get 800 xp per hour more using that method rather than Route 3. Your profits will be slightly lower, but if you have the level and the money to do so, you will be pleased you did it. At level 5 you get the ability to craft Water Runes. If you have completed the Heroes Quest and have several Glory Amulets then using Route 13 will give you 800 xp per hour more than using Route 2, and 1500 xp per hour more than Route 3. Water Runes don't sell very well, but if you want experience and have completed Heroes, these are what you should craft at this level. At level 9 you get the ability to craft Earth Runes. If you continued with Air Runes, by switching to these, your hourly experience will increase to 5200 or more depending on whether you choose to use Route 16 or Route 17. The experience difference between the two is 605 xp per hour, which is less than the difference between the Air Routes, but with the cost of Teleport Runes, and the fairly low price of Earth Runes, profit will be low. If you decided to switch to Route 13, you should ignore Earth Runes altogether. At level 14 you get the ability to craft Fire Runes. These provide the best Runecrafting experience you can gain on your own without using the Abyss if you have a good supply of Rings of Dueling. Using Route 18, you can make over 15,000 xp per hour, which cannot be beaten with or without the Abyss until level 50 if you don't use a Runecraft Company. Like many of the Fire Crafting methods, using Route 18 you will need a lot of Rings of Dueling to gain fast experience. If you can afford all the Rings of Dueling, it is a route that will level you up very fast. If you were crafting Earth Runes using Route 16, you should change to Route 23 to slightly increase your experience gain. If you were using one of the Routes to craft Fire Runes using a Ring of Duelling, carry on with it. If not, switching to either Route 26 or Route 27 is suggested if you can afford to lose money fast. With 6517 xp per hour gained using Route 26 or 10,648 xp per hour using Route 27, the experience is obtained a lot faster than other methods available at this time. If you cannot afford to switch to the Body Rune Routes or were already using a method that gives better experience like Route 18, carry on with what you were doing before. At level 27 Runecrafting you get the ability to craft Cosmic Runes. At high Agility levels these can give you over 8700 xp per hour using Route 30, and they will sell for as much as the Pure Essence costs, so no money is lost. If you have completed the Lost City Quest and are using a method that gives lower experience, change to crafting Cosmic Runes. If you are using a method that gives higher experience, stay with what you are doing unless you feel that you are losing too much money and want to cover your costs while getting good experience. At level 44 Runecrafting you can make the famous Nature Rune. This is what most people stop at, and spend the rest of their Runecrafting life using Route 37, gaining very little experience. If you do want to craft Nature Runes to make money, then use the Abyss. The profits that you can make are much higher and even with the increased risk, it is highly suggested that you do it if you have a Defence level of around 60 or more, and a Range level about the same. If you want experience, carry on with Route 18 until level 50, at which point you are able to get better experience using the Abyss to craft Nature Runes. Routes like Route 30, Route 31 and Route 32 should still be used if you want experience, but with minimal risk and aren't bothered about making lots of money. At level 54 Runecrafting you get the ability to craft Law Runes. These are made in bulk at companies like World 66 and World 99, so if you want to suddenly increase your experience and have lots of money to spend, World 66 is the place for you to be. 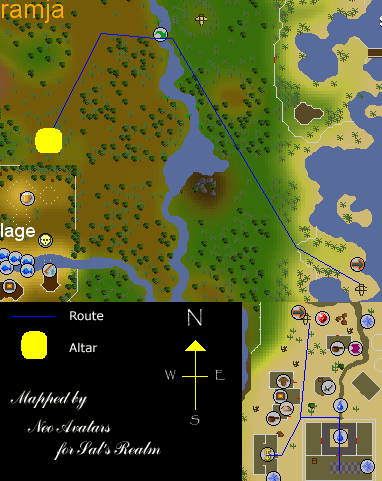 If you want to make some money making Law Runes, you should use Route 42 which will make you around 140,000 gp per hour along with 6500 xp to come with it. Other Law Crafting methods can be used, but the experience is lower. Crafting Law Runes through the Abyss is not advised since you cannot take any Weapons or Armour through the Rift into the altar, making is considerably more dangerous, and slower if the nearest way to enter the Inner Ring is a rock that you must mine your way past. 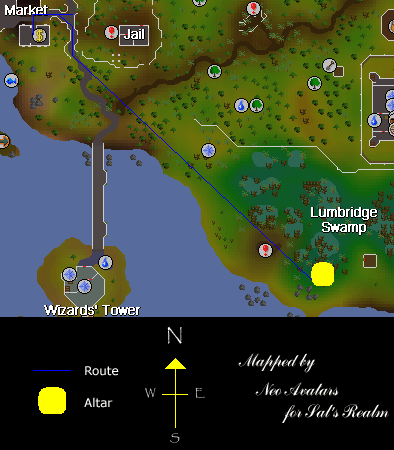 If you have been crafting Nature Runes without the Abyss, you should change to Law Runes if you have completed the Troll Stronghold Quest. 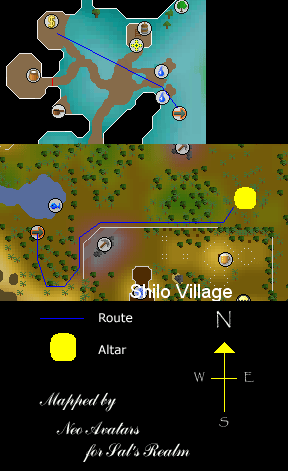 If you wish for slightly faster experience, using the ZMI Altar will produce what you want, although the profits will certainly be down on using other methods such as Nature Rune Crafting. Due to the changing amounts of each Rune you craft as you get higher levels, this is a point where you can build up quite a few Astral Runes for times of desparate need. At level 65 you get the ability to craft Death Runes if you have completed the Mourning's End Part 2 Quest. Since the route to craft them without the Abyss is so long, unless you have been Abyss crafting something else, you should stay with your previous method. If you have been crafting something else through the Abyss like Nature Runes, by switching to Death Runes you will increase both the experience and profit earned by crafting and selling them. If you wish for fast experience while not having to spend a fortune on runners, using the ZMI Altar will be a great help. At these levels it can provide 20,000-30,000+ experience per hour, along with over 100,000gp of profit. In the run for level 91, this extra boost in experience compared to Abyss Crafting can be a significant help that will boost moral, and speed up the arrival of mega-money! Level 91 is what Runecrafters dream of getting. At level 91 you can make 2 Nature Runes out of a single Essence. If you are using the Abyss and making 90 seconds runs with all the Pouches, you will be making 4400 Nature Runes in an hour! If you are a high enough level to use the Abyss, it is very highly recommended that you use this method since you will be gaining nearly 20,000 xp and over 1,000,000 gp per hour! If you aren't able to use the Abyss, carry on with what you have been doing until this point for the final few million experience to 99 Runecrafting.